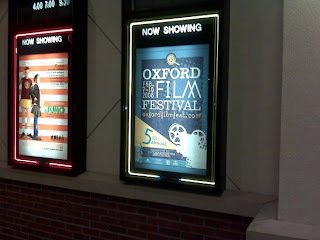 The 5th Annual Oxford Film Festival is halfway over, and we have seen record crowds and heard nothing but thunderous praise. (We're trying to tune out the negativity.) Not to mention having the festival opened by our surprise guest: Academy Award winner Morgan Freeman! We've run out of festival programs, and are about to send a volunteer to color copy more passes. Why did we run out? Because we based our needs on last year's numbers. Therefore, it stands to reason that this year's festival has been nothing less than an enormous success. Filmmakers and panelists seem to be enjoying themselves in Oxford, and why wouldn't they? The weather is absolutely gorgeous, the food has been good at all the parties, and the audiences very responsive. So come out today -- Saturday -- and plan to see the festival favorites tomorrow. You'll be sorry if you miss it!